Congratulations to last year's P3 Eco-Challenge Winners! Water Conservation PSA Contest – schools that submit a PSA will earn 10 bonus points! 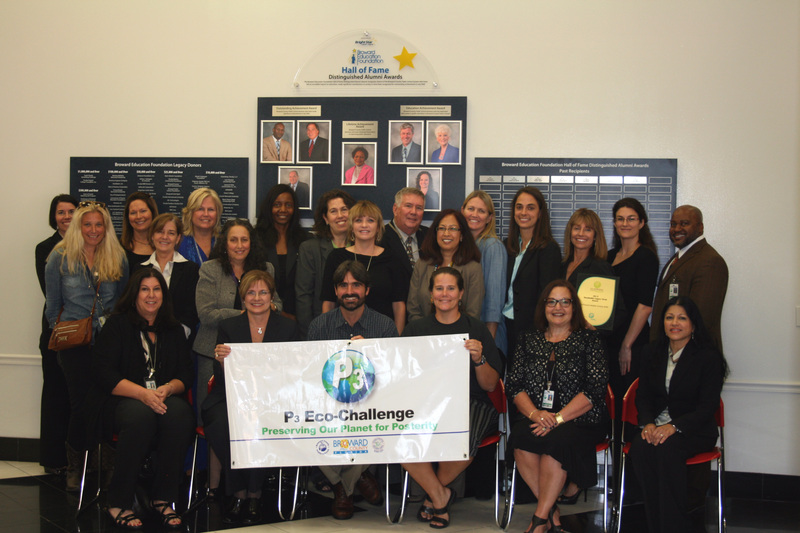 The Broward P3 Eco-Challenge initiative is a multi-divisional and organizational effort among the Applied Learning Department of the Office of Academics, Environmental Health & Safety Department, Information & Technology Department of BCPS, and our partners, Broward County Environmental Planning and Community Resilience Division and the Environmental Conservation Organization (ECO). Open to all traditional and charter Broward County Public Schools (BCPS). It is a free competition for all traditional BCPS schools, staff, educators, students and volunteers. Charter schools – please see the Charter School tab below before you begin your application(s). Overall First Place P3 Eco-Challenge winners from the last five school years (2014-18) are ineligible to apply for this year's overall category. There is a 5-year hiatus for first place winners of the P3 Eco-Challenge Individual School Category in which they won first. They can apply for other categories. All activities described in the school application should reflect projects that are ongoing or will occur during the current school year. All applications with documentation are due online by April 3, 2019, April 10, 2019. Only complete nominations submitted on time will be considered. Before you start the online application, compile and type up your narratives in a Word document that you can cut and paste into the application. Rubrics/metrics and resources will assist you in your application. NEW starting this year: If your school is applying to all categories (top prize) you must also apply to the Florida Green Apple designation. If your school is only applying to the individual categories, your school will receive 10 bonus points for having a Florida Green Apple designation. Finalist will be notified by April 22, 2019. Open to traditional and charter Broward County Public Schools (BCPS) students, educators, non-instructional and custodial staff. It is a free competition for all traditional BCPS schools, staff, educators, students and volunteers. Charter schools – please see the Charter School tab below before you begin your application(s). There is a 5-year hiatus for first place winners of the P3 Eco-Challenge Stewardship. First place winners can apply after the 5-year hiatus. All activities described in the individual application should reflect projects that are ongoing or will occur during the current school year. All applications with documentation should be received by the due date. Only complete nominations submitted on time will be considered. All applications with documentation are due online by April 3, 2019, April 10, 2019. Rubrics and resources will assist you in your application. Finalists will be notified by April 22, 2019. Eligibility: This Public Service Announcement (PSA) Contest is part of the P3 Eco-Challenge for schools. Your school must enter this year's P3 Eco-Challenge in order for your PSA Entry to be eligible for consideration. It does not matter which school category your school enters. Your school will receive 10 bonus points added to your overall P3 score for entering the PSA Contest. However, your school does not have to enter a PSA to be eligible to enter the P3 Eco-Challenge. The PSA winner will be announced at the P3 Awards Ceremony. Download the PSA Guidelines, Entry and Media Release Forms packet from the Application tab. 8) Charter schools – additional requirements - see link P3 for Charter Schools below. To see this year’s winners and their bios, see link below under Nominees and Winners. Overall Categories (school applies to all categories): First Place (Gold) Winner and Runner-Up - $2,000 First Place (Gold) Winner, prizes for all winners. *These are the anticipated minimum monetary awards based upon the overall success of fundraising. Last year the Overall School Winner received $2,000 and the runner-up received $1,000. Individual Category School Winners received $500 each, plus special awards from our sponsors. For a list of all winners and their prizes, see link below. 60 Possible Points for Schools Applying to All Categories: If your school is applying to all categories, your school must also apply for the Florida Green Apple School Designation. Your school should be listed under http://www.fldoe.org/schools/healthy-schools/green-schools.stml. The information you provide to the Green Apple application directly applies to the P3 Eco-Challenge! 10 Bonus Points For Schools Applying to the P3 Individual Categories Only: If your school applies and is designated as a Florida Green Apple School, as shown in http://www.fldoe.org/schools/healthy-schools/green-schools.stml, you will receive 10 bonus points. School Resources List – 2018-19 School Resources List – school resources to assist in applying for each school category – has local, state and national environmental contacts, lesson plans, and state standards. Welcome to the P3 Eco-Challenge! The Broward P3 Eco-Challenge initiative is a multi-divisional and organizational partnership between the Broward County Public Schools (Applied Learning Department of the Office of Academics, Environmental Health and Safety Department, Information & Technology Department), Broward County Environmental Planning and Community Resilience Division and the Environmental Conservation Organization. It is a district competition that welcomes charter schools but will be charged a fee to enter. Please send your check when you open up your online application; applications will not be judged if checks are not received by April 5, 2019. All nominees receive generous awards and prizes for their stewardship, thanks to our very generous sponsors. We wish to thank all of our sponsors for supporting our schools, educators, administrators, students, custodial and non-instructional individuals in their environmental efforts! This initiative is a multi-divisional and organizational effort among the Applied Learning Department of the Office of Academics website, Environmental Health & Safety Department, Information & Technology Department of BCPS, and their partners, Broward County Environmental Planning and Community Resilience Division and the Environmental Conservation Organization (ECO). 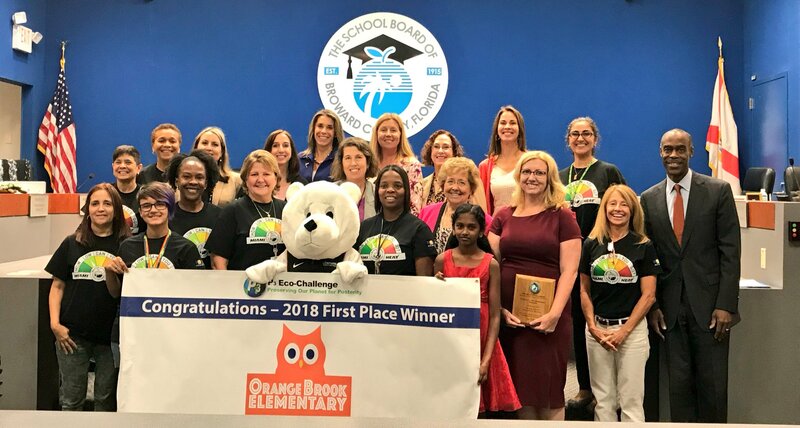 On January 17, 2018, Broward County Public Schools was one of a few districts that were awarded a Florida Green School District gold designation, the highest level of distinction, at the Florida Healthy School District Symposium for going beyond the minimum requirements of Florida Statutes. To learn more about the Florida Green School initiative visit their website. On October 29, 2013, the P3 Eco-Challenge team won the Florida Green Schools Award (district level) for its efforts in the district’s environmental initiatives. Pictured above - The P3 Team and some of the 2012-13 winners. There are two P3 challenges: The P3 School Challenge and the Environmental Stewardship Recognition. Competitors in the school challenge must document participation in or implementation of sustainable practices in one or more of the categories of School Grounds Enhancement, School Sustainability, Curriculum Integration, Community Involvement, Administrative Support, and Innovation/Special Projects. The Environmental Stewardship Recognition originated from our partner, Environmental Conservation Organization (ECO), and has been incorporated into the P3 challenge. The stewardship competition involves educators, students, non-instructional and custodial staff demonstrating evidence of promoting civic responsibility, environmental stewardship, and educational awareness of environmental issues under the categories of Awareness and Involvement, Current Professional Development/Affiliation, Instructional Soundness and Creativity, and Skill Building. Further information, resources, and the application can be accessed online through the main P3 website. Participants in the Broward P3 Eco-Challenge will be recognized for their efforts during an award ceremony at the Long Key Nature Center in Davie. Top prize for the school that best exemplifies the green practices overall receives the P3 top award of $2,000 and the top teachers will receive $500. School category winners, students, educators, non-instructional and custodial staff winners will also receive awards. The new P3 2018-19 posters are here and are being ponied to all schools. Online application now open and closes April 3, 2019.